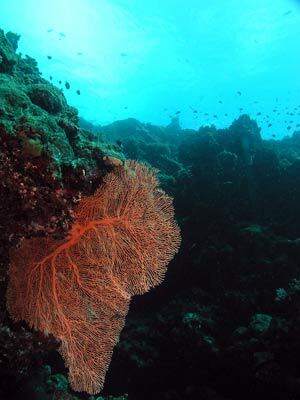 Michael McFadyen's Scuba Diving - Pauls Rock, North Efate, Vanuatu As I have indicated in other articles on Vanuatu on this web site, there is much more diving in Vanuatu than the SS President Coolidge. Even though you can now fly direct to Santo without even having to go via Port Vila, this does not mean that you should not visit Vila. 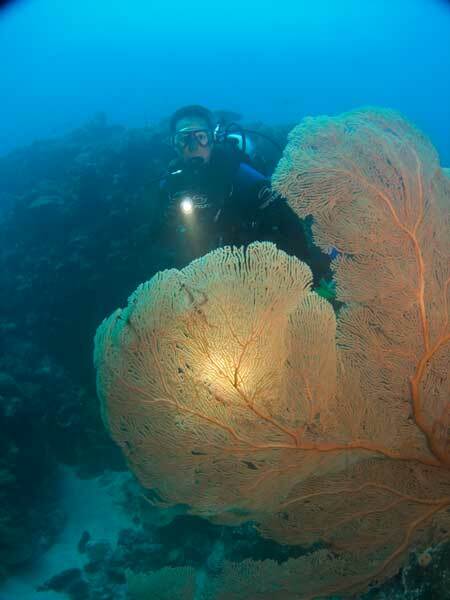 Some of the most interesting dives I have done have been at Vila. The main island of the country is Efate which contains the capital of Port Vila. Before World War 2, the main town was on the northern side of the island at Port Havannah Harbour. Named by Captain John Erskine in 1849 after his ship HMS Havannah, the port was the major centre of activity on Efate during the war. Remnants of the war remain, buildings, road construction equipment and a water reservoir can be found and below the water you can see the remains of an anti-submarine net across one entrance to the harbour and several aircraft, including a Corsair. 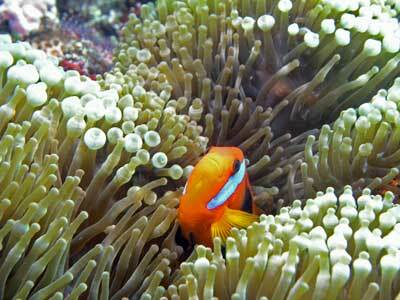 Havannah Harbour is located about 40 minutes drive from Port Vila. 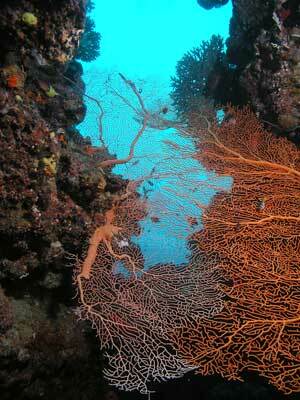 There are two ways to dive here, the first being with Golden Wing and the second with Tranquility Island Dive. The second one also has accommodation but I cannot comment on any of its abilities. Golden Wing is a trimaran that takes divers and non-divers on cruises of the harbour. Stops are made at Hat Island and Pauls Rock for dives and in between, off a beach for lunch. See my more detailed article on the Golden Wing. 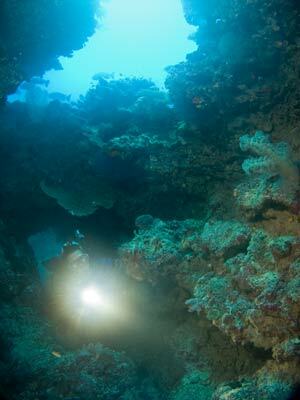 The best dive in this area is Pauls Rock. This is located at the south-western end of Port Havannah Harbour between Hat Island (Eretoka) and the mainland. Consisting of a single bommie rising up from over 35 metres to less than two, this is a really great dive or snorkelling site. The kidney shaped rock is mostly a gentle slope down to the seafloor, but the southern side has a shear wall which I had already decided from my last trips would be very interesting. More about this later. The boat moors on the top of the bommie and you drop down to the southern side. 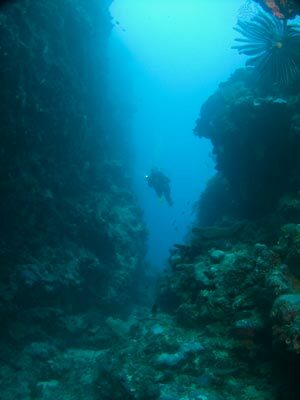 The normal dive is to go in a clockwise direction around the bommie. As soon as you hit the water you see that there is a huge amount of fishlife here. Lots of trevallies and red cod swarm under the boat. 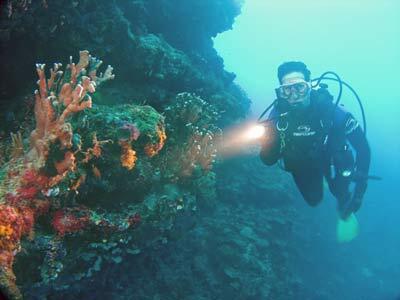 However, leave this area till the end of the dive to explore. Once on the bottom, head south-east and drop over the wall. This is a shear wall that goes from perhaps 10 metres to well over 35 metres. Follow the wall to the west and you go around to the other side of Pauls Rock. There is a large boulder just off the wall and this creates a sort of canyon. Just past here, the wall turns to the north. Off to your right the reef slopes back to the mooring and the top of the reef. Heading north, the slope steepens a little and then you see some very large gorgonias. 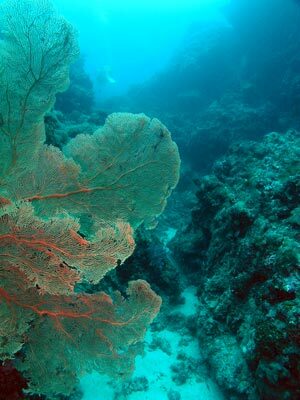 Soon you come across a spot where there are quite a few gorgonias. This signals the location of the entrance to a tunnel. In 2010 the gorgonias were almost totally blocking the access to the tunnel so we did not try to enter it. 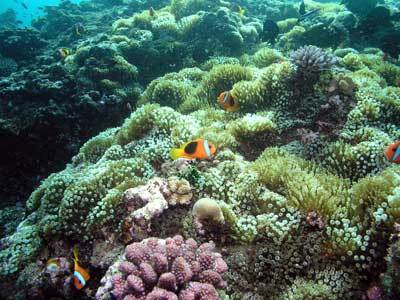 The tunnel goes under the coral and comes out on the eastern side of this section of the reef. The tunnel is fairly low and at the start, wide. It narrows up and the last section is a bit tighter. Once out, head south. The reef here is like a gully between the nearby reef and the main bommie. The depth is about 20 metres or so. About 20 to 25 metres along here there is a huge moray eel. Back in 1995 I was videoing this eel and just as I stopped, it attacked the fin of Peter Whitelaw, the owner of Golden Wing. This was quite funny and I was very annoyed at the time that I had stopped the video. Peter remembered the attack when we dived with him again in 2007. He confirmed that the eel still lives in the same place. The gully splits up here and there are a couple of places to explore. Back heading south, the gully narrows a bit. This does not last long before it opens right up. At this spot you are near the southern end of the bommie. 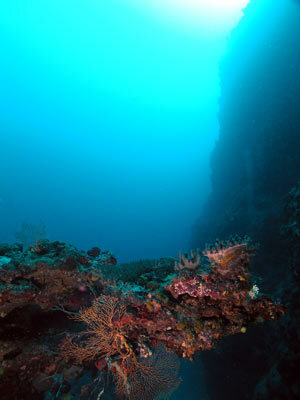 Here the drop-off from the top of the bommie becomes a shear wall that drops down to more than 35 metres.You are back near where you started the dive. Soon you are back where you started in about 20 metres. Continue in the direction you are heading but start a gradual ascent as you circle the main bommie. 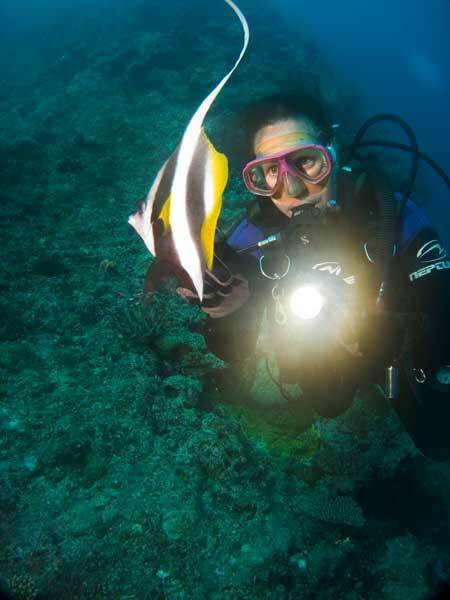 Come up to 10 metres and you will be amazed at the fishlife. 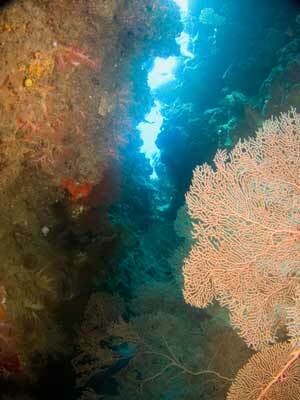 You will see that the top of the bommie is actually in two parts, separate by a small gully. 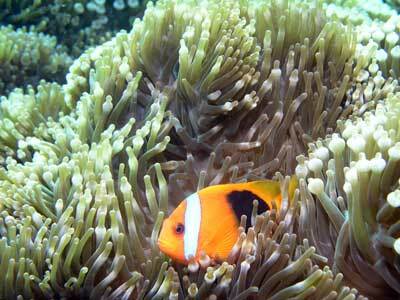 The top of the southern one is covered in anemones and clownfish. These are some of the best examples I have ever seen and you can get some good photographs. The top of the bommie is about five metres so you can spend your safety stop here while looking at the fish. Visibility here is normally pretty good, say a minimum of 20 metres and as good as 30 or more metres. Water temperature is about 26° in Winter and up to 28° in Summer. 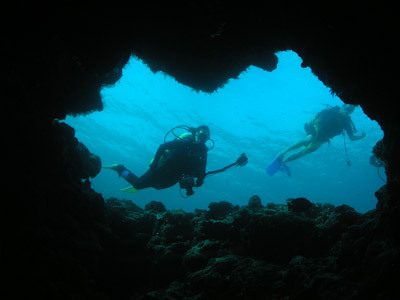 This is a great dive site, one that you should not miss doing if you visit Vila. Highly recommended for all divers. You can do this dive with Golden Wing.